Hi everyone...I bit the bullet and decided to try to build my first multi rotor...a versacopter 280 that just came out. I'm brand new to all of this. I've done everything by watching the videos and putting it all together. I'm to the point to configure Cleanflight on my Naze32 board. I get it all set up, flashed the firmware to the latest stable build. So far, so good. I'm using a Turnigy i6 transmitter with the ia6 receiver. However, now when I try to check my receiver/transmitter, I get a problem. The problem is that when I test the receiver in cleanflight, the pitch and roll move together. I move the right stick forward, and the pitch and roll both go to the right. Then, when I try to pull the right stick back, there isn't that much movement, but if I pull back and to the left, the values for both pitch and roll go down (to the left in cleanflight). I've tried reflashing the board, checking all of the wired connections, making sure there are no mixes on, and everything else I can think of. What do you think I should do next? I'd love to get this thing in the air soon!!!!!!! Hi drpoulette welcome to the forum! Sounds like your receiver settings in cleanflight are incorrect. First make sure that in your i6 you have no coupling of channels (like elevons mixed in or something). Next check the configuration tab in cleanflight. Make sure that under the receiver section you have the correct receiver settings selected. Also check the receiver tab and make sure you got the channel mapping correct. Sounds like your receiver settings in cleanflight are incorrect. First make sure that in your i6 you have no coupling of channels (like elevons mixed in or something). Next check the configuration tab in cleanflight. Make sure that under the receiver section you have the correct receiver settings selected. Also check the receiver tab and make sure you got the channel mapping correct. I've done all that. I can't get the two channels to operate separately. Pitch and Roll at the same time no matter what I do. Frustrating!!! Maybe it's a hardware problem? Hmm check your board and receiver to make sure there is no continuity between the pitch and roll channels. Also make sure you have Quad X selected for the layout and not Wing or something. I'm pretty sure that all checks out, too. Have you tried testing the channels independently. 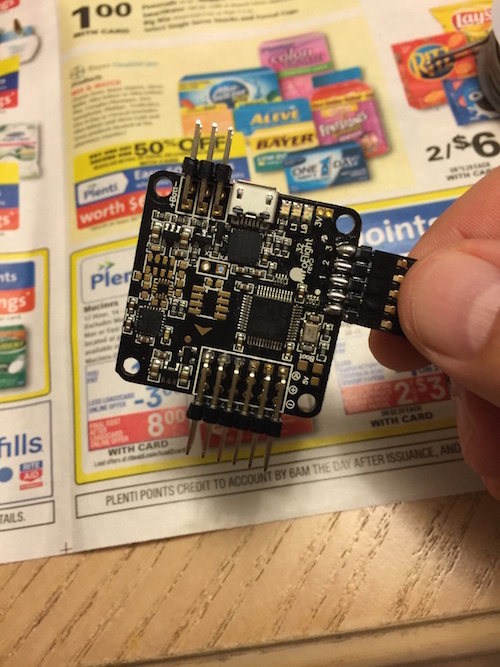 Like if the Throttle (CH3) works in cleanflight try connecting it to the other pins (pitch and roll) and see if it can control them properly. Try the other channels in throttle and make sure they can control it properly. You might be able to isolate something that way. On the tx side does the "display" in the model menu act correctly? I know you checked for mixes and such but the display should show what the tx is sending as far as the firmware is concerned. If you didn't look at it already it maybe it will show something. Probably not but it's easy to look. I'm trying to isolate the problem, but even when I connect the pins to different channels, those two operate in unison. Here's a n00b question...which channels typically operate pitch and roll? I know I've seen it somewhere but can't find it. See Section 16.08 in the documentation downloaded from the files tab at the Hobby King Page. The stick assignment assumes you have a mode 2 TX. The channel mappings will be the same but the sticks will be different if you have a mode 1 TX set another mode from the default. I thought about that, too. But mine is in Airplane mode. So apparently I'm having a problem with Ch1 and Ch2. My right stick is not operating correctly. But you say the TX "Display" shows CH1 and CH2 working independently as expected with the right stick. So it's not the sticks or the TX programming since the "Display" shows the mixes. or the RX (possible if CH1 and CH2 two signals pins are connected) Easier to test if you have a couple of servos to try or a known good RX. You could use a couple of ESCs plugged into CH1 and CH2 and check that the motors work independently (no props!). If your ESCs have BECs ideally you should disconnect one of the BECs (disconnect the middle red power wire from the "servo" lead that comes from the ESC and plugs into the RX) but it shouldn't matter for a short test. If they don't have BECs then you will have to power your RX with a BEC or 5v/6v battery. What tests did you try just using individual connections? Do you mean that when you put CH1 and CH2 on the Thr and Yaw inputs and moved the right stick you saw the Thr and Yaw control indicators move in the same way as the Pitch and Roll indicators moved before? Did you try just one connection, say just CH1 to Throttle and nothing on Yaw or the other inputs? If so did just the Thr indicator move? If other indicators moved then the problem is likely on the FC board or its configuration. If not then it seems likely the problem is in the wiring or the RX. Try the same test with CH2 to see if its is consistent. I assume from what you've said that CH3 and CH4 work correctly when attached to the Thr and Yaw. Do they work correctly when attached to Pitch and Roll? Stupid question. How do I test Ch1 since it's connected to the three wire plug that powers the receiver? Can't really switch that one out too easily. you need some spare servo extensions or similar to make up some test leads. What about CH2? Thank you so much! I was having this same issue, and I switched to airplane, and they now operate independently. Adding this to my list of troubleshooting for FT Customer Support! Did you ever figure out the problem? I having the same issue with cleanflight, in the receiver tab the throttle and Aux 1 are moving together. Make sure that in your radio, that you don't have it set up as "2 aileron", it needs to be set up as "1 Aileron"